For many people the thought of managing accounts and taxation is the main barrier to setting up any small business, and a B&B is no exception. But it doesn't have to be that scary, all you have to do is make sure you record everything and keep every piece of paper, then you can hand it all over to someone to look after if you're that way inclined. The accounts part of it is relatively straightforward. For every piece of money that goes in or out of the business there should be a record. It can be written in a ledger, added to a spreadsheet or input into an accounts program on a PC. Ideally there should be a piece of paper to accompany each transaction. Examples are receipts for food, furniture or other accommodation related expenses, or an invoice for when you charge someone for something. In the case of guests paying for their accommodation, you are unlikely to issue an invoice, but your booking system or diary can act as documentary evidence for that money. As a side note you should also have a receipt book so that customers who ask for a receipt, business travellers perhaps, can be given one. 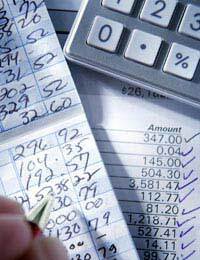 If keeping on top of the accounts is something you find difficult or too time consuming, you can employ a bookkeeper to come in every now and then and sort out all the accounts. This might be particularly advantageous if you've purchased a PC accounts package but make sure the bookkeeper knows the particular system you have chosen. As far as tax goes, the rules and regulations change fairly frequently so it's best to look on the government's tax website run by Her Majesty's Revenue and Customs for an up-to-date picture. The taxes you will be subject to will fall under the categories of rates levied by the local council, VAT and taxes on your earnings. Business rates will be charged when you start running a B&B unless the part of the house used for guest accommodation is small, and there aren't many guests, in which case you can pay the lower domestic rate. The council will investigate and let you know, but if you are unsure about this seek the advice of a tax advisor who knows the system before you approach the council. You do not have to register for VAT unless your business starts going over a certain turnover threshold. This is currently £67,000, but it is usually raised at budget time each year. There may be an advantage to registering because it means you can reclaim the VAT that you have spent on items for the business. But it also means you will have to charge VAT on your accommodation rates, which might make you uncompetitive. If you go over the threshold you must register though. If you are registered for VAT you will have to return your VAT forms periodically, usually quarterly. You then have to pay the taxman the difference between the VAT you have charged out and the VAT you have paid. The tax rules that are used to decide how much tax you should pay on the income you make from your business will depend on the legal structure you chose when you set it up. Many small businesses run under the 'sole trader' umbrella but they could be limited companies or partnerships too. The tax rules and opportunities are different for each structure, but in all cases the taxation process will be taken from the accounts that you have kept. So once a year pass all your accounts to your accountant and they will deal with all the relevant accounting and taxation issues. Or, if you are running as a sole trader and confident that you can do it, you can fill in a self-assessment form yourself. If you feel ill at ease with managing business finance and tax affairs there are various sources of help. Courses and information can be obtained from local business organisations such as Business Link, or look at local adult education classes for book-keeping or management courses. Even your local Revenue and Customs office will offer tutorial videos, DVDs and CD's with documentation, manuals and samples. Some also offer free courses for people setting up as sole traders or limited companies to advise on what records need to be kept and how to do it.